Oscar + Martin were greatly improved since supporting Metronomy earlier in the year at Manning Bar. Their blend of vocals, backed by beats worked, but not always, falling out of time at certain points, but still created enjoyable music as the openers. 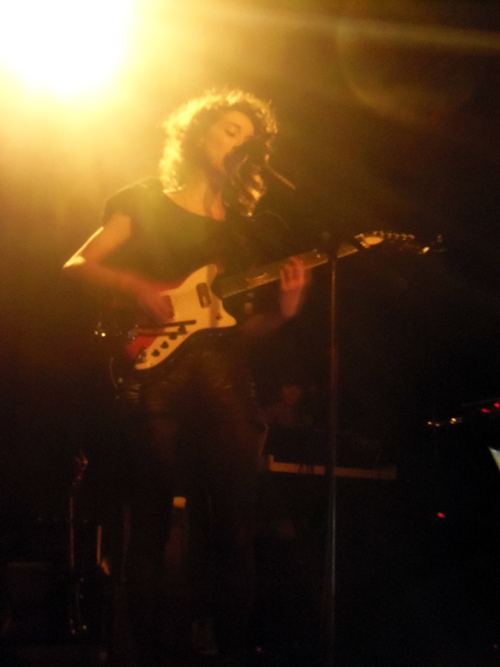 Prancing on stage in high heels and short leather shorts, you can tell that St Vincent is a rock star. With the two backing keyboards/synths overlayed with Annie Clark’s precise guitaring, they channelled a hyper-real and at times quirky reality. Her range was demonstrated by pure loudness with a song resembling a garage rock number, Krokodil where she thrashed through the crowd as well as a cover of She is Beyond Good and Evil, by 80s post-punk band The Pop Group. This was in stark contrast to the more mellow songs like Dilettante, which she said was written about New York City. St Vincent played a set full of songs from the 2011 album, Strange Mercy, as well as 2008’s Actor. Perhaps the most appealing aspect about seeing St Vincent live, is the contradiction between her almost angelic, vulnerable appearance, and her suddenly breaking into a huge guitar solo. Or in tonight’s case, the theremin in Northern Lights. She ended the night perfectly by a quiet rendition of The Party, followed by an emphatic Your Lips Are Red.